It was historlc, a first of its kind and to a young teenager and his brother, it was quite impresive. 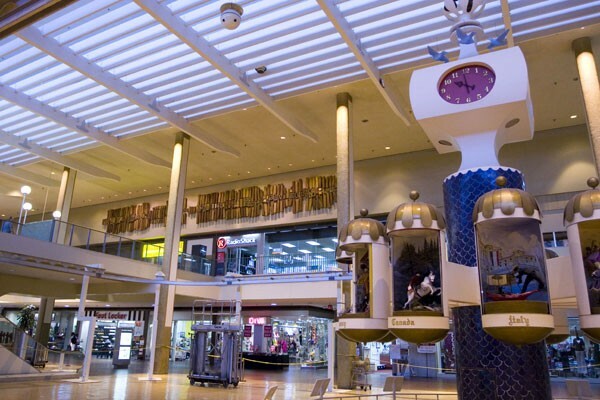 It was Midtown Plaza and it was the first indoor mall in the nation. Of course in 1963, Midtown was the only indoor mall I had ever seen. I was impressed but I had nothing with to compare it. I place the start of Midtown’s decline with the opening of Greece Town Mall. In of itself, Greece Town Mall, wasn’t much of a mall, but unlike Midtown it had free parking. Those were always Midtown’s problems, you had to pay to park and the stores were never great. The last destination store in Midtown was a leather shop which relocated to the suburbs about a decade ago. For the last several years, I’d get to Midtown once a year to hike the Rochester Skyway. It was depressing hiking through a once vibrant shopping area. I did my last hike there earlier this year. I moved the hike up so get it in before the Mall closed. Anyhow, 13WHAM has put together an interesing Midtown Plaza History. Midtown will be demolished next year, but had been slowly dying for years. Save for those who live downtown, the shopping simply will not be messed. Hat tip photo: City Newpaper. My connection to Midtown is somewhat deeper than is David’s, I suppose, given that I was working in the place on and off over 30 years. First job was at what was WVOR/100.5fm, which had it’s studios on the third floor, to the left of this shot, at the time. Later, I would work at Xerox, also left, and over at Chase Manhattan, to the right. Oddly enough, to the center of the shot, on the upper floor, is the shop that lasted there all that time; A Radio Shack… which of course is a business that saw changes over the years. I bought my first mobile DJ control board there, 30 years ago. I still have that board. Still works, too. Used it for an amp bridge about 6 years ago. And I saw the place as few do, while working there… I saw it during all the off hours imaginable, since I was on call at the bank, or the Radio station… It was not unusual at all for me to come into the place at all hours of the day and night. You can imagine the place dark, not lights on to speak of. Huge, and a little intimidating in the darkness. One thing I do remember also about those years is the rather unique clock, shown in the interior shot on the page I linked. There are 12 nations represented on that clock… And each one of the pods you see, contains a diarahma depicting that country. It moves, and has a soundtrack for each country, too… And was all made by hand, and worked for the first time the week the mall opened back in 1962. At the time, the electronics were all electron tube based, and tape recordings provided the (rather poor quality) sound. Since then, a computer has taken over the operation of the display which vastly improves the sound, but some of the hand-made parts have broken, and the gent whose clock outlasted him, isn’t around to care for his creation. Sad. I can remember begging my sister to wait just until the top of the hours, just so I could hear the music and see all the doors opened at once… And see all the displays, instead of just the half-hour where only one of them opened. If this all sounds quaint, keep in mind; This was magical stuff for a 5 year old, particularly for the time. And the time itself was of the same magic; The country was under the Presidency of JFK, the world, supposedly, was united..And our place in the world was pretty much secured, except for those nagging nuclear bomb drills in school, and some background noise during the dinner hour about a place called Vietnam. Still, this was quite the place when it opened in 62; One of the first of it’s kind. I suppose the guys who put it up… Foreman, McCurdy, and so on, rather figured it’d be around a bit longer. I still shop here for some of my Christmas giving… for two reasons… I work here… and I like the idea of coming here each year. It’s something of a tradition for us to bring the boys down and show them around. They particularly like the model train displays that get set up each year at various locations, and of course a ride on the monorail s a good thing… But I know that this place is a memory, now on borrowed time. And that’s sad. Thus the unannounced, yet impending demise of an old friend is noted in this blogger’s musings for the week. Well, now it’s gone, and it’s all done but for the wrecking ball, and I cannot help but feel a milestone long coming, has finally passed.